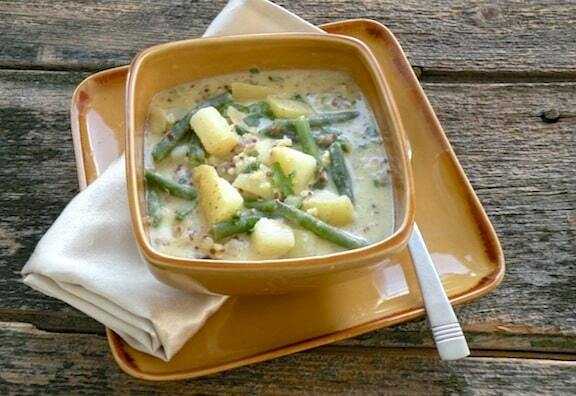 Potatoes, green beans, and quinoa make a refreshing trio in a cold summer soup. Serve with fresh corn on the cob and a colorful salad or grilled veggies. Though I think this soup tastes best chilled, if you can’t wait, it’s good warm, too! Peel thepotatoes and cut into approximately 1/2-inch dice. Cover with water in a small soup pot and bring to a simmer. Cover and cook until the potatoes are about half done, about 10 minutes. Add the green beans and cook until both are tender but not overdone, about 10 minutes longer. Remove from the heat, but do not drain. Meanwhile, combine the quinoa with 1 cup water in a small saucepan. Bring to a slow boil, then turn the heat down and simmer gently until the water is absorbed, about 15 minutes. 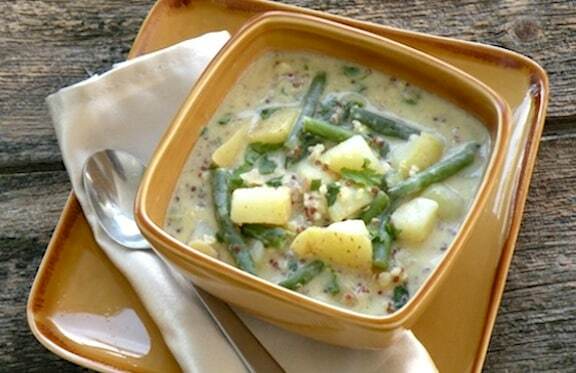 Stir the quinoa into the soup pot with the potatoes and green beans, once they’re done. Combine about half of the rice milk with the vegan sour cream in a bowl and whisk together until smooth (this won’t be necessary if you’re using homemade vegan sour cream). Add this along with the rest of the rice milk, plus the remaining ingredients, to the soup pot. Stir together. Allow to cool to room temperature, then cover and refrigerate until chilled before serving. Or, as suggested in the headnote, if you can’t wait, serve at once. See more of VegKitchen’s quinoa recipes.